By Evan Ackerman on 12/01/10 • Leave a comment! There’s really no way to film yourself and something else at the same time with a traditional video camera. 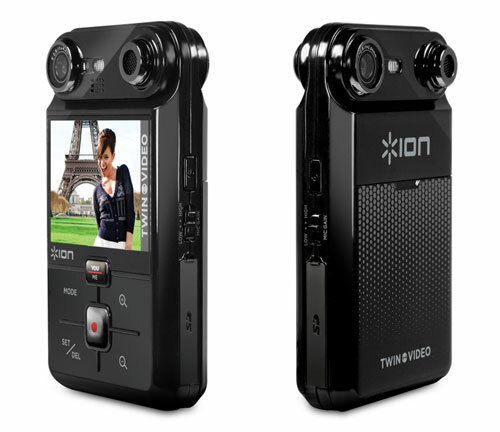 I wouldn’t have called this a problem by any stretch of the imagination, but Ion Audio has gone ahead and solved it anyway by installing an extra lens at the back of their “Twin Video” cam, which is now available for purchase. When you hit the record button, the camera stores just one single stream of video. A button on the back of the camera lets you toggle between each lens on the viewfinder, if you want to inject a little bit of yourself into whatever else you’re filming. The camera itself is solidly mediocre, recording 640 x 480 video at 30 FPS onto an SD card. Thankfully, it’s only $120, meaning that if it’s something you could see yourself using, it might be worth a try. I know what you’re thinking: why would anyone, anywhere, ever want a foldable TV if it doesn’t fit in your pocket, which this concept definitely doesn’t? 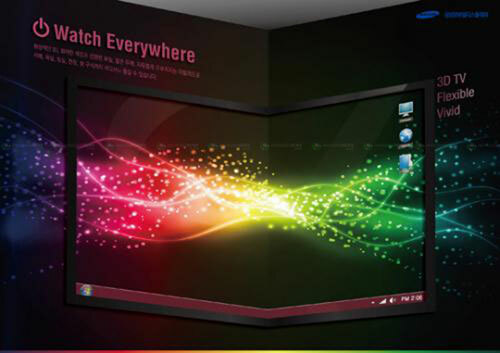 Samsung says that by folding (or “flexing” might be more accurate) their display, they can target the 3D sweet spot to viewers anywhere in the room. My guess is that the TV would have some way of detecting the general distance and orientation to viewers, and then the screen (an AMOLED panel) would flex to optimize the 3D experience. Samsung says that something like this might show up in 5-10 years, but it seems like that’s going to be way, way too late to solve the 3D sweetspot issue, which is just one of the many problems plaguing 3D TV. If you remember, 3D TV was one of the things being flogged last year at CES, and it seems like this year is probably going to be no different, no matter how reluctant consumers might be to buy into the questionable hype. I’ve had my Pogoplug for a several months now, and I’m still a big fan… Enough of a fan to have gone and bought a couple for my job (what, you think I blog for a living? HA!). 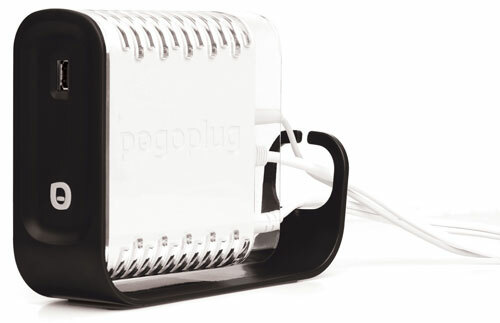 Now I’m kicking myself, though, because Pogoplug is introducing the Pogoplug Biz, which not only includes a whole bunch of useful business-y features, but also comes in a color that isn’t purplish-pink. Sometimes, 500 Nerf darts per minute is just not enough. Sometimes, you just need heavier artillery. Enter the Mk 19 Nerf grenade launcher, a faithful reproduction of the Mk 19 grenade launcher used by the military. Like the real thing, the Nerf Mk 19 is belt fed, it just fires Nerf rockets instead of live grenades. It’s powered by batteries and compressed air, and is just generally incredibly awesome. The gun by itself weighs 45 pounds, and that plus the box, belt, battery, and air tanks is over 100, so it’s not like you’ll be running around with it. But hey, that’s not what grenade launchers are about, right? Unfortunately, this particular piece of foam destructiveness is completely handmade (by someone who goes by “Q” apparently), took four and a half years to build, and no, you can’t buy one. Here’s a vid of it firing from the back. The days of buying spray bottles full of cleaning chemicals are over, since through the magic of science you can now turn ordinary tap water into a powerful industrial solvent thanks to the Activeion’s Ionator. The Ionator takes regular water and converts it into ionized hydric acid, which (I know, I know) sounds really bad for you but is actually one of the safer industrial solvents out there, as long as you don’t accidentally inhale too much of it (’cause if you do, it’ll kill you). The hydric acid (also known as OH2) has a small electrical charge and functions in much the same way that regular soap does: it breaks up dirt particles and then sticks to them, allowing you to wipe surfaces clean. It also kills bacteria, yay! 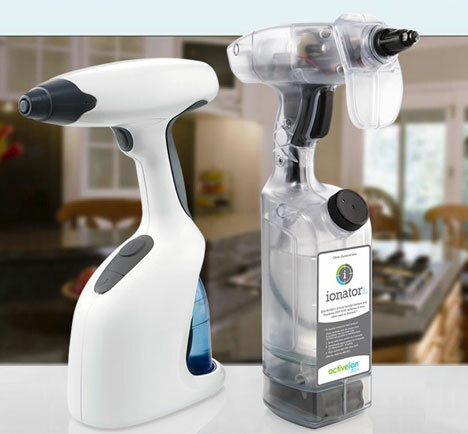 Although Activeion is a bit vague on exactly how their product manages to create a chemical out of water (something about ion exchange membranes), it’s apparently a fancy and complicated process, since the battery operated squirt bottle with the ActiveIon technology inside will cost you $170. The “pro” version (which is slightly more rugged, I guess) is $330. But, it’s endorsed by Bill Nye, so it must be awesome, right? Before you buy one of these, however, you should be aware that organizations like National Consumer Coalition Against DHMO are working hard to ban hydric acid, since (among other things) it’s used as a an industrial coolant and ends up as a major component in acid rain. So, before you start spraying your stuff with a new chemical instead of your old ones, make sure you get all the facts. By Evan Ackerman on 04/19/10 • Leave a comment! -Video of the first public demonstration of Stickybot III, the latest version of Stanford’s climbing robot that uses the same type of sticky material that gecko toes are made of to stick itself to a sheet of glass. 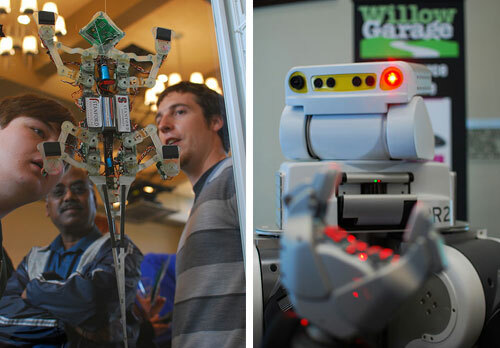 -Video from the back seat of Junior III, a robotic car that can drive (and park!) itself. -Video demonstration of the world’s fastest industrial robot, the Adept Quattro, as it goes up against a moving platform controlled with a Wiimote. There’s more coverage over on BotJunkie.com, so come check it out! There are already a bunch of options for getting yourself rescued from the wilderness (where there are bears that want to eat you). Most of these options are fairly situational… A cell phone is great, but you need reception and batteries. A flare gun is great (and fun! ), but it only works once. A signal mirror is great, but you need to have sun. What you really want is something simple, reliable, portable, and effective, which (it turns out) means big inflatable rescue balloon. 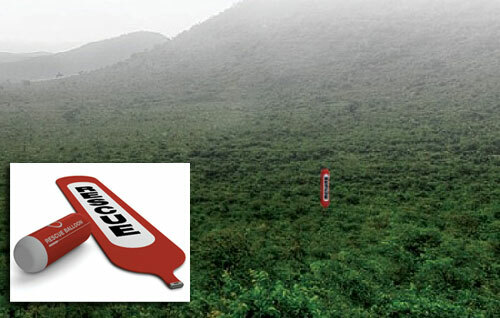 The Rescue Balloon not only has a creative name, but comes rolled up around its own little cylinder of helium. If you find yourself not being able to find yourself, simply panic, stop panicking, inflate the balloon, send it up, and wait for rescue. The balloon doesn’t really work at night (maybe a future version might include a little LED or something? ), but I imagine it holds onto the helium long enough to function for at least a day or two. Now, if they’d just make the balloon a little bit bigger, maybe it could actually, you know, rescue you. Oh, and for the record, they’ve had these things for scuba divers for ages… If you surface and can’t see the boat, you inflate a tall skinny balloon to make yourself more visible in the water. Genius! Over 3 billion people use solid fuel (like wood) for cooking. This is not ideal, since the toxic smoke from indoor cooking fires kills 1.6 million people per year while wafting up into the atmosphere where it does all kinds of other bad stuff (in total, it’s about 50% of the nastiness of CO2 when it comes to climate change). What do you care about all this? You don’t! What you do care about (maybe) is sweet camping gear. 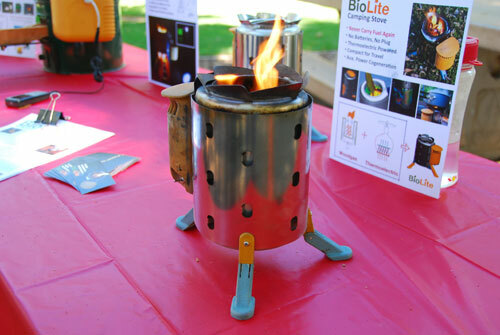 The BioLite stove is portable, efficient, and powerful. 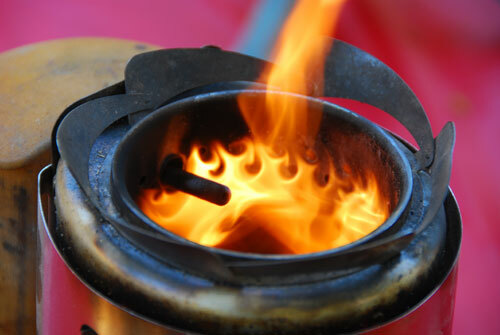 It burns pretty much anything you care to toss into it, uses only half as much fuel as a regular fire, and boils water significantly faster than a conventional petroleum fuel camp stove. The reason that we’re posting about it, though, is that what makes the stove perform so well is an attached thermoelectric generator. The generator uses heat from the fire to power a small fan that improves combustion efficiency by blowing air back into the stove, and there’s enough energy left over (1-2 watts) to charge portable electronics through a USB port. The BioLite camp stove is a bit bulkier than some other camp stoves and weighs a pound and a half, but you don’t have to carry fuel, and unless you’re camping in the arctic, you probably won’t run out of stuff to burn. It should be available sometime this year for around $80. Incidentally, the BioLite stove also reduces smoke emissions by 95%, which saves lives and the environment. But, you know, whatever… (There’s a larger version for the developing world for $50).